We begin our day with breakfast at the hotel and then depart for a full day tour of Istanbul visiting the majestic Blue Mosque, the Hippodrome, Egyptian Obelisks and Topkapi Palace. After lunch we will visit the magnificent Haghia Sophia and the Grand Bazaar. After the tour you will be transferred back to your hotel. Breakfast - Lunch. Overnight in Istanbul. 08:30 pick up from your hotel to visit Spice Market and followed by a boat cruise through the Bosphorus, the strait dividing the European and Asian continents, Following lunch break in the afternoon, visit the luxuriously opulent Dolmabahce Palace, the last residence of the sultans. A drive to the Asian part of Istanbul crossing the Intercontinental Bosphorus bridge to visit Camlica Hill The highest point where you can overlook Istanbul and take nice pictures. Tour finishes around 17:00, transfer back to hotel. Breakfast - Lunch. Overnight in Istanbul. After breakfast you will be transferred to the airport to take a flight to Izmir, the birthplace of Homer and the -quot;Pearl of the Aegean.-quot; After your arrival, we will drive to Pergamon. Here you will be delighted to visit such sites as the Asclepion and Health Centre. As you make your way to the Acropolis, the Red Basilica originally a temple of Serapis can be viewed. The most spectacular structure is certainly the theatre, a remarkable piece of engineering built into the steep hillside. After the tour we will drive to Kusadasi. Breakfast - Lunch. After tour bus to Fethiye with non smoking, fully air-conditioned bus (duration 4 hours). Overnight in Fethiye. In a bay near Kekova we stop for swimming, dinner - the 2nd night. In Gokkaya Bay optional water sports are available. Dinner, relax in this pirates haven or party the night away at the Smugglers Inn - the 3th night. 08:15 pick up from your hotel to visit Perge antique site in detail; Stadium, Roman Gate, Nymphaeum, Roman Bath, Hellenistic gate, Colonnaded Main Street and the Agora. Lunch on the Köprüpazari stream near the Aspendos Theater after lunch visit Aspendos Theater and the Historical Aqueducts. Shopping Break where also the Turkish handcrafts are introduced-bull; Introduction of Side and an hour and a half free time. Breakfast - Lunch. Depart from your hotel to visit Devrent Valley to see the unigue fairy-chimneys. Drive to Pasabag (Monk''s Valley) to see the most interesting mushroom-shaped pinnacles.Drive to the city of Avanos for lunch.In the afternoon visit another beautiful open air museum at Goreme where the remains of rock-cut churches and Christian settlements date back hundreds of years. Lastly, before returning to your hotel, visit the natural castles at Uchisar. Breakfast - Lunch. Depart from your hotel to visit Red valley, and explore the famous rock- cut churches and hike 5 km through the Gulludere valley (Rose valley). Then visit Cavusin village.This village is famous for the houses and churches of the christian clegymen. Drive to the pigeon valley for lunch. In the afternoon visit Kaymakli underground city. Where early christians lived in fear and faith. On the way back visit the natural castles at Ortahisar. Breakfast - Lunch. 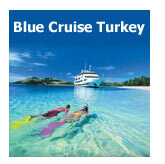 • Domestic flight tickets from Istanbul to Izmir.